Below is the It's You I Like sheet music by Mister Rogers. We have 1 arrangement for It's You I Like Piano, Vocal and Guitar Sheet Music. Mister Rogers' Neighborhood (Arr. Paul Murtha) - Baritone B.C. 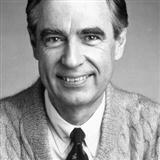 Mister Rogers' Neighborhood (Arr. Paul Murtha) - Baritone T.C.